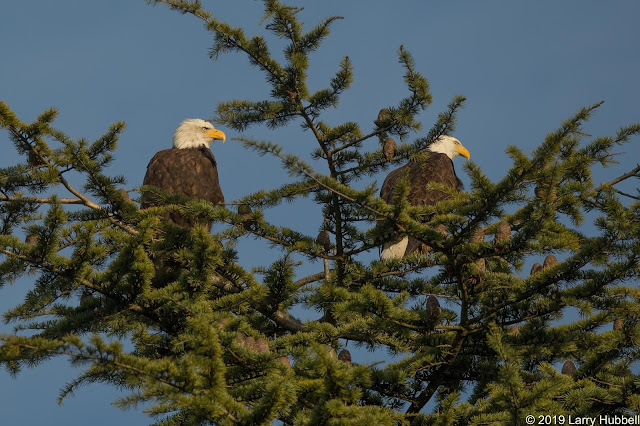 Last Saturday, I met some new friends who were photographing Bald Eagles next to Union Bay. We were standing near the parking lot north of the Waterfront Activities Center (WAC) while observing Marsha and Monty. They are the eagles who built and lost a brand new nest last year. 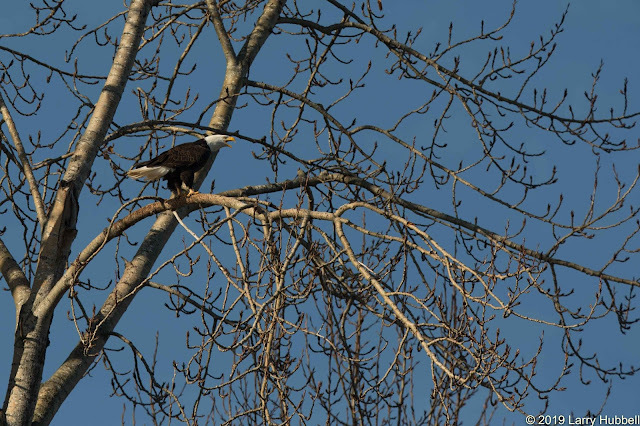 The light was nice, but branches partially obscured the eagles. 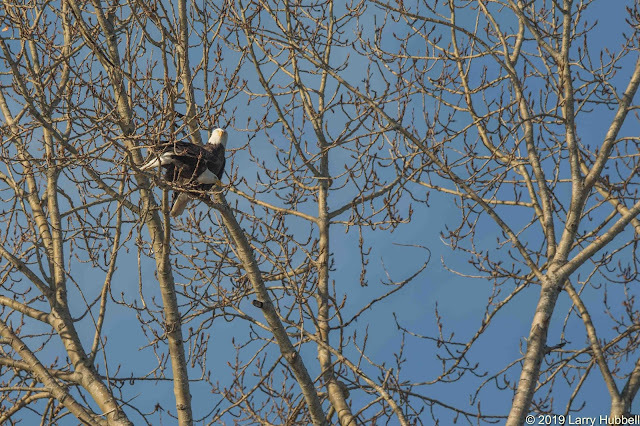 Plus, we could not see Talia and Russ, the eagles from the northern nest on Union Bay, even though they were nearby. 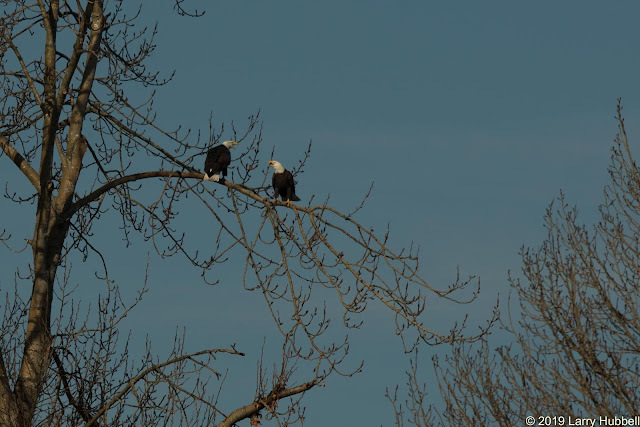 My new friends asked, 'Where is the best place to photograph the eagles?' Without hesitating I found myself replying, 'With the winter sun in the south, the best spot to see all four eagles would be sitting out in the water, just to the east of the Activities Center.' Later, I found myself thinking, maybe I should take my own advice. On Wednesday, I gave it a go. Just before noon, I put down my anchors just south of the WAC buoys. Marsha was surveying the bay from the top of one of the same cedars where she and Monty had been sitting on Saturday. 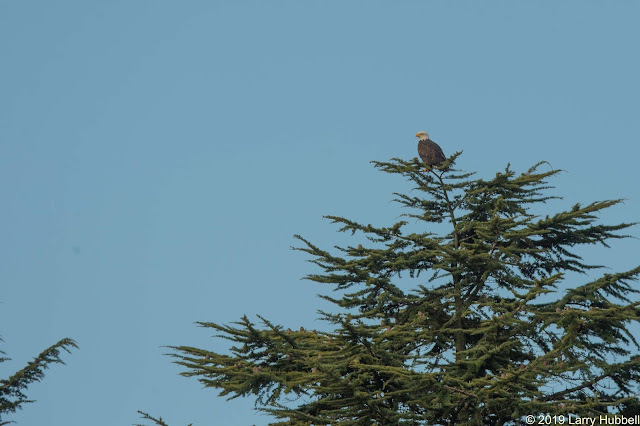 I could not spot any of the other eagles. My waiting began. 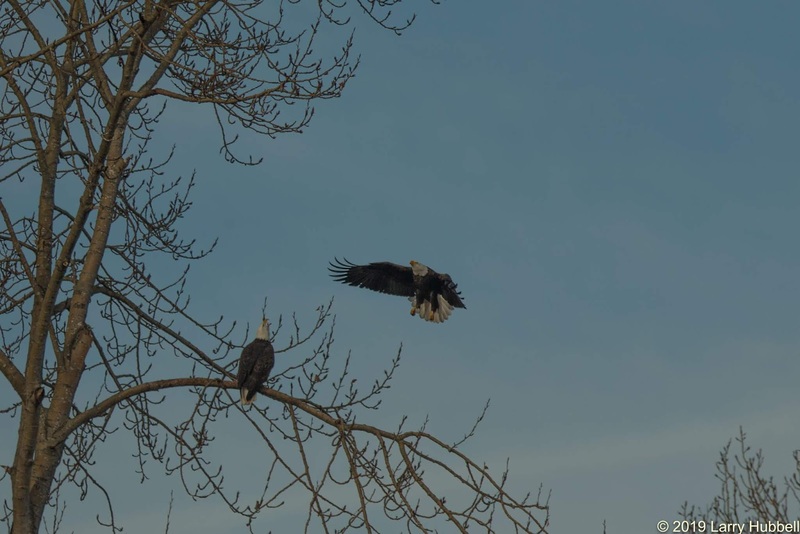 Previously, when I have watched all four Bald Eagles take to the air near the WAC it seemed to me that they were negotiating the boundary between their territories. Monty and Marsha moved in and claimed Montlake Cut and Marsh Island in the fall of 2017. Since then the four eagles often sit and hunt from the trees in front of Husky Stadium. A couple of hours later, I finally thought to take this situational photo with my phone. It required adjusting my conception of bird photography and putting down my telephoto lens. 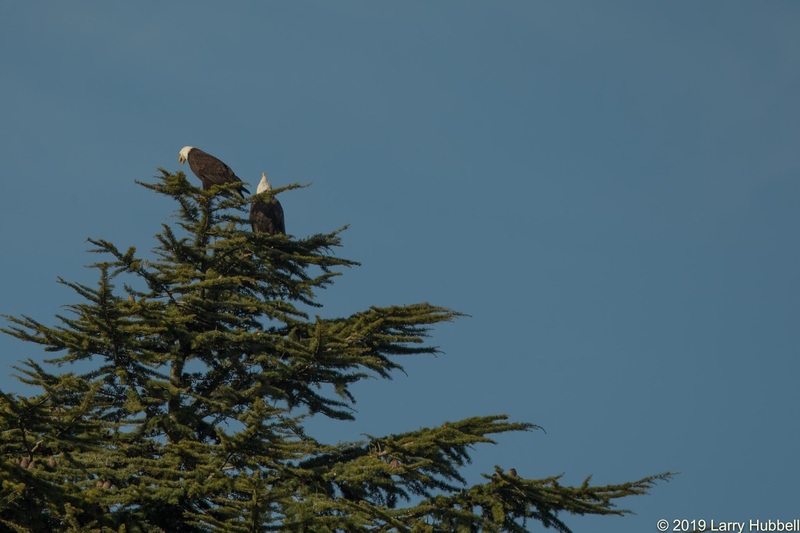 In this photo, all four eagles are sitting in their customary hunting locations. Monty and Marsha are sitting on top of the second and third cedars from the left. 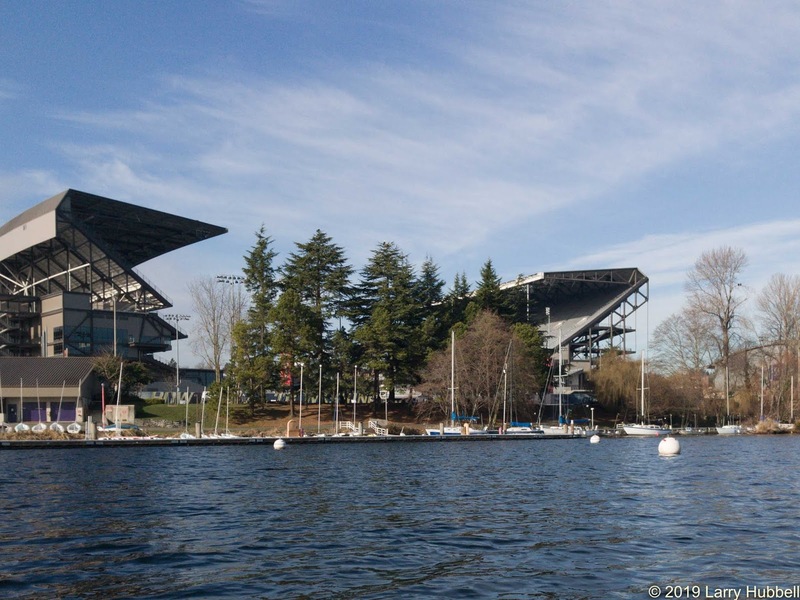 (At this angle, the third cedar appears to be midway between the two halves of Husky Stadium.) 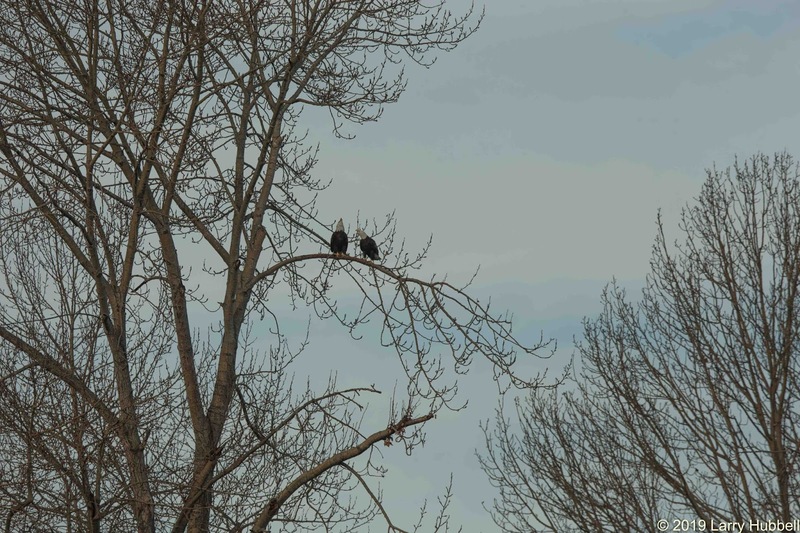 Russ and Talia are sitting on the upper, right side of the tall leafless cottonwood tree, just to the right of the stadium. 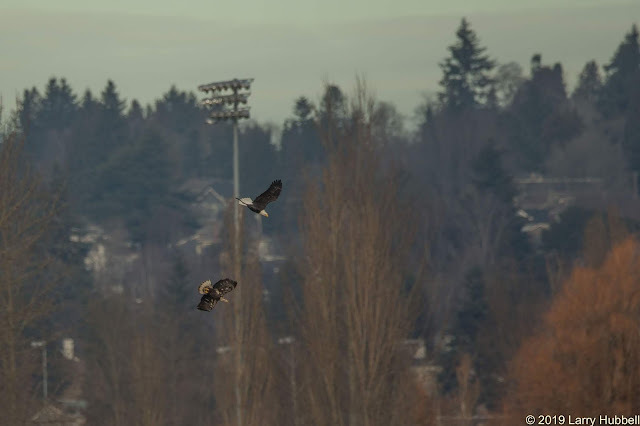 Part of my inspiration to observe the eagles was a December eagle photo which was posted in the Seattle Times. Click Here to see the photo. 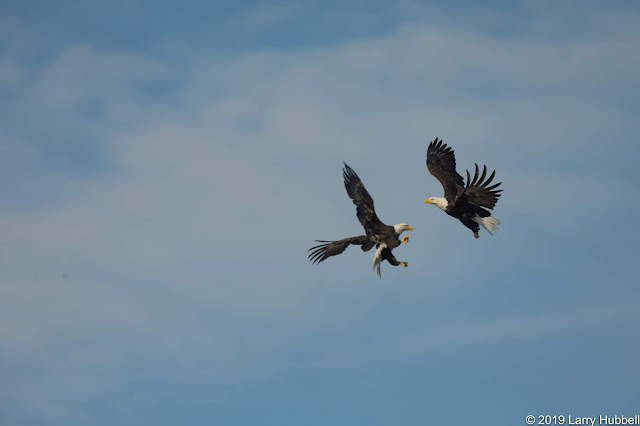 The comments associated with the photo mention the idea that the two interacting eagles might be involved in in-flight courtship. I was curious whether I might see courtship activity. Note: Monty and Marsha are definitely thinking about raising young in 2019. They started building their replacement nest early in November of 2018. Watching Marsha simply sitting there, all by herself, was a bit boring. I was easily distracted by a nearby crow. 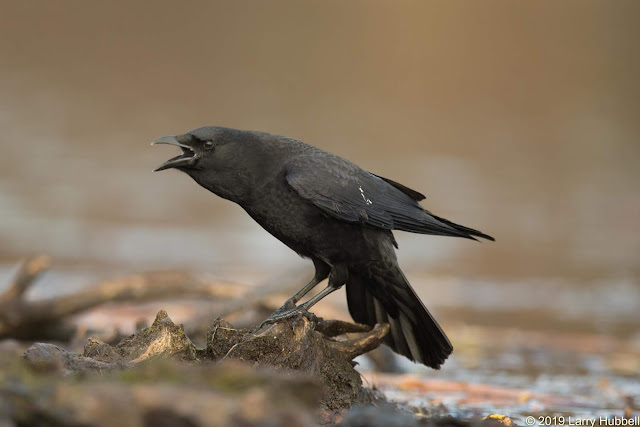 The crow was closely inspecting a small mud island and obviously searching for food. When it noticed me, it seemed to object to my very existence. I turned out to be no threat. The crow resumed its search. Moments later, it popped up with a gray-brown wing. Most likely the meatless wing was left behind by one of the Bald Eagles. If you enjoy a challenge you might search through some of the ducks in your field guide and see if you can find a species with a white border on the trailing edge of their grey-brown, secondary wing feathers. I will give you my guess later in the post. The second eagle to appear in the area was not one of the three I was expecting. 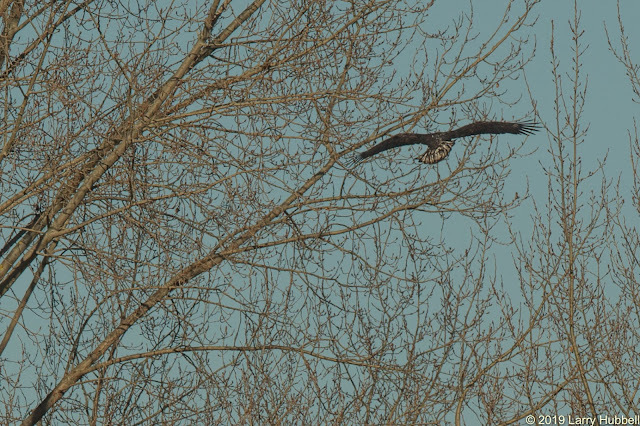 It was an immature eagle who was clearly not yet ready to settle down, select a mate and defend a territory. The eagle was sitting north of Marsha in what I believe is territory belonging to the neighboring Bald Eagles - Talia and Russ. Marsha seemed totally unconcerned about the young eagle. 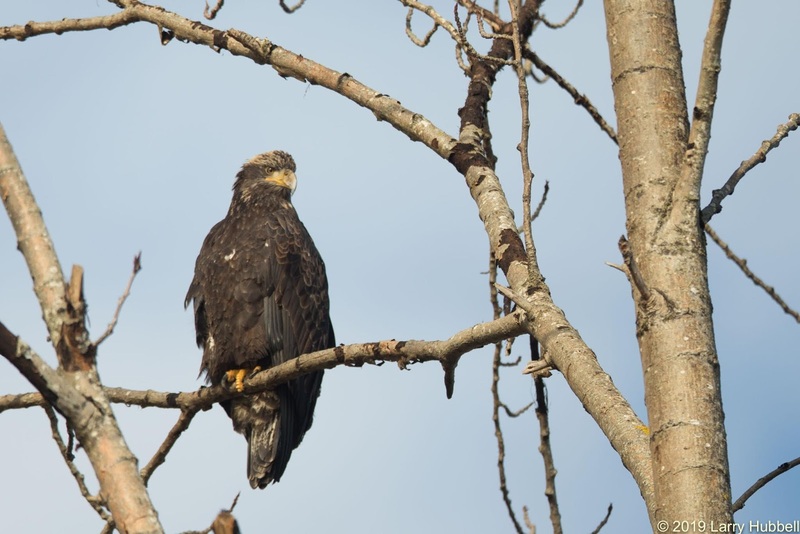 It takes about five years, plus or minus six months before eagles mature and gain the familiar white head and tail. With some light colored feathers on the top of the head, with irises fading toward a light brown - but not yet yellow, with some white on the tail feathers and with a beak that is no longer dark - but still not brilliantly yellow, I am guessing that this bird is about to begin its third year of life. If you are interested in determining the age of young Bald Eagles, my best effort on the subject can be viewed by Clicking Here. In a few moments, Russ and Talia showed up and flew to their customary location in the cottonwood tree. Normally, when either pair arrives in this area there is quite a bit of vocalization - especially if one or more of the other pair is already on site. This time the vocalization occurred but then Russ and Talia sat down facing the young intruder. Normally, they would sit facing south to keep an eye on Marsha or Monty. 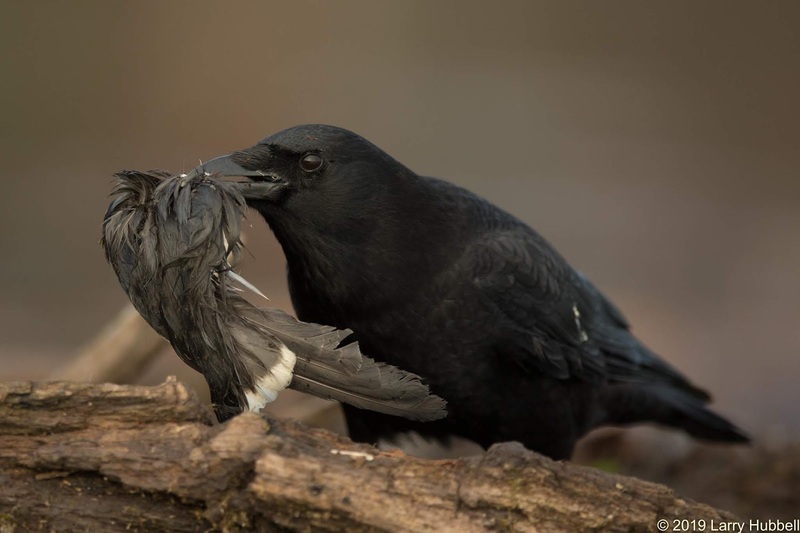 Apparently, the young bird was considered more of a threat - to hunt in their territory. For one thing, he was already on their side of the border. Marsha was still slightly to the south, and technically, in her own territory. Russ flew one tree farther to the north, calling aggressively while keeping a close eye on the young eagle. In about five minutes, the youngster gave up and headed north. It flew directly away from Talia and Russ. I could not see if it landed but I did notice a dozen or more Double-crested Cormorants flush from the light poles above the baseball field. I suspected they became nervous when the young eagle passed over. Around one-thirty Monty showed up. He might have been somewhere nearby the whole time, or he could have been south of 520 by what I call Kingfisher Cove or over in Portage Bay. These areas are all part of the territory he and Marsha usurped from Talia and Russ and also from Eva and Albert. Eva and Albert are often referred to as the 520 Eagles. 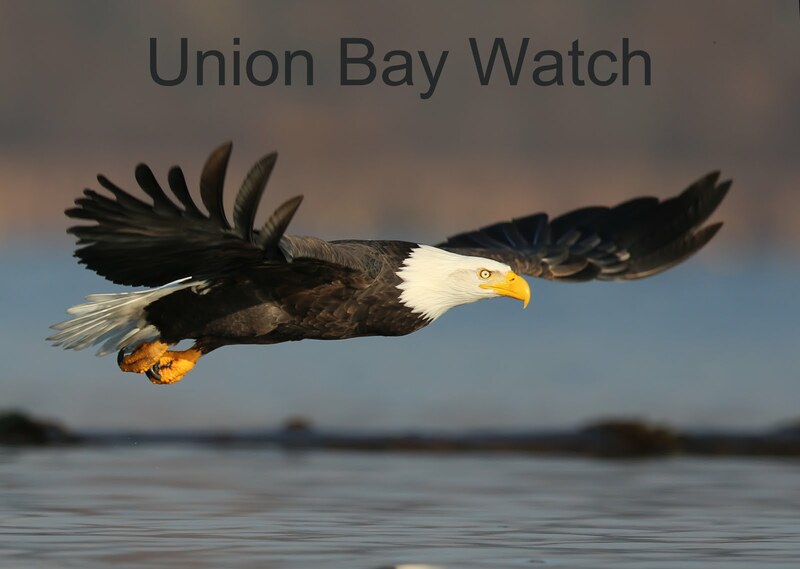 Their territory is now limited to the south and more eastern portion of Union Bay. It is centered around their nest in Broadmoor. In any case, this was the first time I saw Monty on Wednesday. Marsha's vocalizations were pretty similar, but in her case, they may actually have been words of welcome. She was clearly excited by her mate's return. Moments later one of the eagles flew. It headed straight out over the bay along the invisible border in the sky. 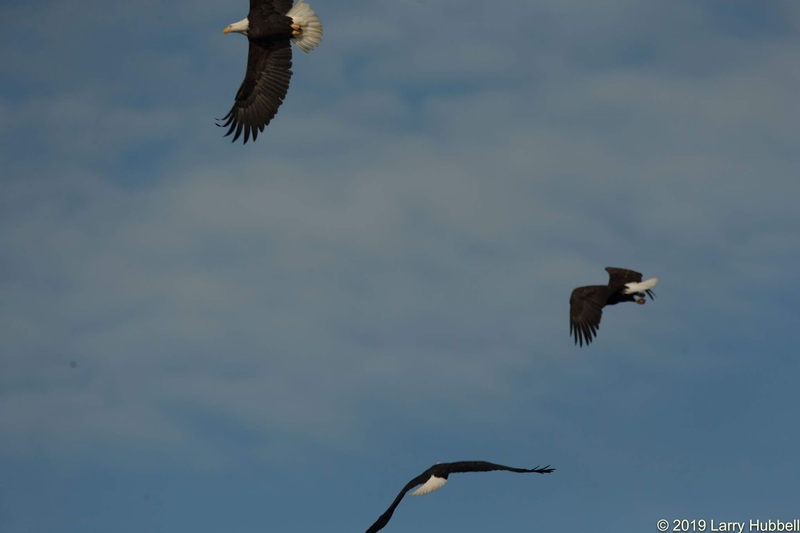 In seconds, all four eagles were in the air. They circled each other directly in front of me. I believe this particular interaction was between the two females and therefore a continuation of their ongoing territorial negotiations. ...attempted to get all four birds in a single photo. Next time, I need to take two cameras or at a minimum have my phone ready to get a wide-angle view of the process. Having a second pair of arms would also be helpful. 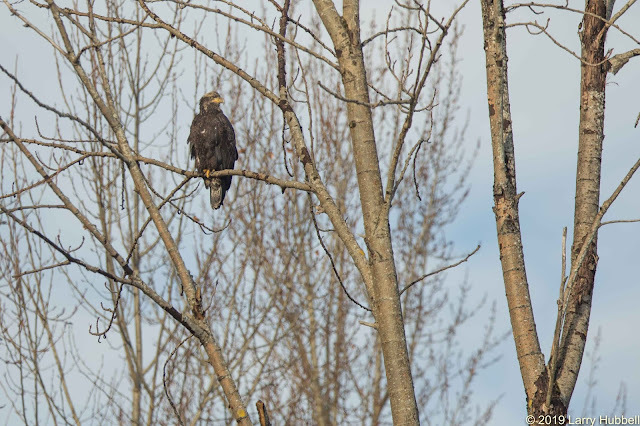 Both pairs of eagles returned to their respective perches and seemed to be very proud of their success in redefining their territorial border. A half an hour later, Russ was in the air again. 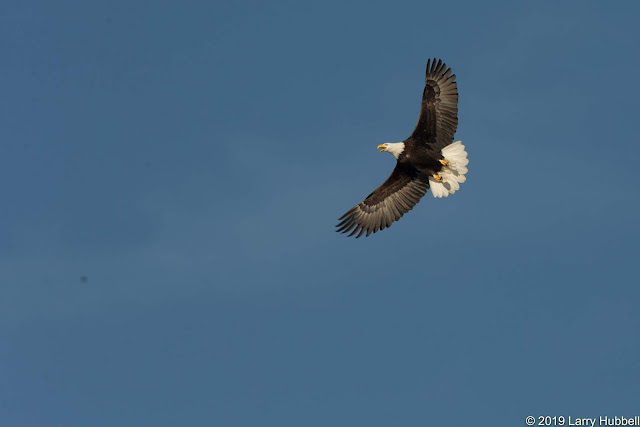 He headed north to chase a young eagle out of their territory, near the baseball field. I suspect it was the same hungry youngster we saw earlier, still hoping to sneak away with a snack. Afterward, Russ returned to his perch near the southern border and was once again welcomed by Talia. Twice, during the afternoon, I watched one eagle from each pair take to the air and fly out over the bay looking for food. In both cases, they flew away from the border and into their own respective territory. Both times, there was not a single noise or stirring of a wing. All of the other eagles remained calmly at their respective perches. Obviously, eagle mating activity must occur on Union Bay. However, in front of the Waterfront Activity Center and Husky Stadium, all I have seen are a lot of territorial interactions, interspersed with the occasional hunt. ps: My best guess is the wing in the crow's mouth came from a female Wood Duck. Although, I do not see any of the reflective blue-green feathers that I would normally expect to see just above the white border. A female Bufflehead was another possibility I considered, but their white speculum is normally more extensive than such a small white trailing edge. Etta, one of my classmates from Seattle Audubon's Master Birder Class, just suggested the wing might belong to an American Coot. Given the high number of coots on Union Bay in the winter, given that I have seen Marsha eating two different coots in the last month and given the lack of reflective blue feathers (which a Wood Duck would normally have) I have been persuaded. Thank you to Etta! 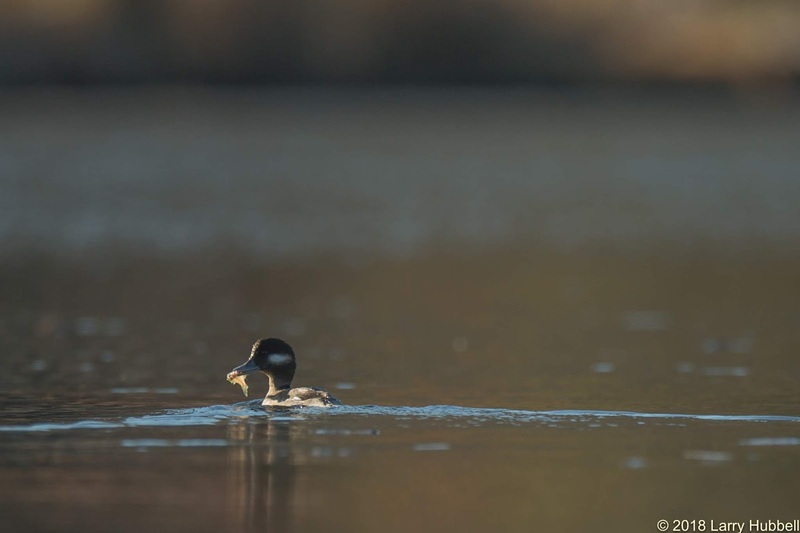 Bufflehead: This is a female. They are so different in coloring from the males that they can be easily mistaken as a separate species. They are native to Union Bay.